Canada has jumped into the NAFTA re-negotiation fray with high ambition and a heavy dose of social conscience. 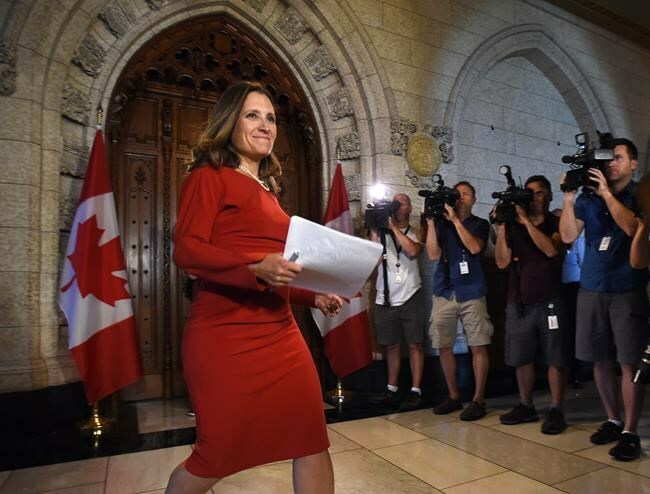 Global Affairs Minister Chrystia Freeland has finally revealed Canada’s priorities in the negotiations. Canada will not simply accept the U.S. effort to transform the Trans-Pacific Partnership and bits and pieces of the Canada – E.U. Comprehensive Economic and Trade Agreement (CETA) into a “new and improved” NAFTA. New and improved for President Trump, that is. As a communications exercise, the Minister’s presentation was great. I did not expect her to get into the nitty gritty detail and she didn’t. There is little value in telegraphing the fine details of one’s position before absolutely necessary. The core objectives hit all the right hot buttons and play to many of the key stakeholders. The objectives are a balanced mix of offensive and defensive priorities. Some of the Canadian objectives may have a very short shelf life. The Ministers will be meeting over dinner on August 15 in Washington. They will be focussing on scheduling and probably on identifying “no go” issues – those not ripe for negotiation, perhaps never. I am not certain how many negotiating groups there will be. Canada’s Chief Negotiator, Steve Verheul, says he is able to staff 28 groups. Others have suggested there will be fewer. Perhaps they have fewer issues. Will any issues miss the cut? Are any likely to fall off the Ministers’ table? I expect that Ambassador Lighthizer will state that elimination of NAFTA Chapter Nineteen is non-negotiable – it is a done deal. Then not only does Canada need to negotiate to keep it, we will have to negotiate to keep it in play. Most negotiations start with everything on the table. Will any issues miss the cut? Are any likely to fall off the Ministers’ table? What if Ambassador Lighthizer declares that elimination of NAFTA Chapter Nineteen is non-negotiable, that there is no point discussing it? Such a scenario may be a stretch but there are no rules in a trade negotiation at the best of times. Refusing to discuss particular issues could lead to a great unravelling. While I doubt that the U.S. will want to sabotage the talks before they start, I do not expect smooth sailing. Canada and Mexico want to discuss better visa-free access for business professionals. This was not among the objectives tabled with Congress by US Trade Representative Ambassador Robert Lighthizer. Canada attaches high priority to modernization and updating the list of qualified professions. Many high tech professions did not exist 25 years ago. The NAFTA oil and gas industry considers expansion of the list to be a priority. Don’t expect Ambassador Lighthizer to be prepared to engage on issues which appear to undermine President Trump’s Buy American, Hire American policies. If ‘America First’ politics drive the U.S. priorities, it will be very difficult to achieve a balanced result. Canada wants to negotiate on climate change in the Environment Chapter. The world – at least much of the E.U. – will be watching with interest. Climate change is not a priority for the U.S. – indeed, the USDA has instructed staff not to refer to it as such. Extreme weather event is the approved description. It may be a “no go”. Why would Ambassador Lighthizer agree to put his President on the spot? The U.S. will be prepared to begin negotiations on the Environment with the TPP text. Canada will be much more comfortable with CETA — which already accepts climate change language — as the starting point. Including a Trade and Gender Chapter in NAFTA is progressive. Canada already has Trade and Gender in its FTA with Chile. The White House may like this. Was the idea run past Ivanka Trump? There are special provisions in the TPP which guarantee more favourable treatment for New Zealand Maori. The U.S. has special procurement carve outs for indigenous business, as does Canada. There is no reason Canada should not pursue special treatment for its First Nations, Métis and Inuit and their businesses. Canada could begin by extending to First Nations and Inuit their rights under the Jay Treaty of 1794, which provided for free movement across borders for indigenous peoples and their goods. The U.S. respects its Jay Treaty obligations. Canada does not – perhaps because the treaty was done between the United States of America and His Britannick Majesty. Indigenous rights was not included in the U.S. NAFTA objectives published on July 17. Did Canada give Washington a heads-up that this was important? I didn’t hear much from the Foreign Affairs Minister about Canada/Mexico issues. The new Labour and Environment Chapters will be important for — and perhaps in the minds of some, aimed at — Mexico. But the labour safeguards negotiations will likely begin with TPP Chapter 19 on labour rights. We should expect that the U.S. will play divide and conquer with both Canada and Mexico. The temptation will be too hard to resist – there are no rules in a knife fight, nor in this type of negotiations. It is not in Canada’s interest, nor in Mexico’s, to join the U.S. in piling on the other. Minister Freeland correctly predicts a tough negotiation. For months, this has been blindingly obvious. It will be difficult for all negotiating teams to work with the uncertainties created by the Tweeter in the White House. But Canada has a highly experienced team at the negotiating table. They are our first line of defence. The Interagency hearings chaired by U.S. Chief Negotiator John Melle, June 26 to 28, revealed Canada and Mexico have many friends and good customers in the U.S. Many stakeholders told Mr. Melle and his interagency colleagues that Canada and Mexico were not a problem. They discussed how their exports had doubled, trebled and quadrupled under NAFTA. They were adamant that the Administration should do no harm. True, a few with trade irritants were there too. Often other stakeholders would challenge and rebut the critics. The consensus was not unanimous but it was strong and favoured keeping and improving NAFTA. This positive attitude towards NAFTA, and the relationship-building being quarterbacked by the Canadian Embassy in Washington (and the team in Ottawa) is crucial. It underlines that NAFTA and free access to the Canadian market benefits millions of middle class Americans. I am pleased to hear the Minister say that she will not accept a bad deal. What constitutes a bad deal remains to be seen. The Ministers’ press conference the morning after their dinner may help to better define the scope of the negotiations and priorities. Canadians then will better understand the prospects for improving its most important trade agreement. NAFTA can be improved for all concerned – if the professionals are left to do their job. There will likely be an unusually high level of Ministerial involvement – which is not necessarily a good thing. Ministers should be called upon, when needed, to break up logjams and resolve impasses. Their routine involvement would inject political priorities and egos. The negotiations may, at times, be plodding – but such processes are designed to reach mutually unsatisfactory agreements. Experience has proven that this is the best kind of outcome.